If you forgot to add baking soda to your cake recipe, you may want to get out the bowl and whisk again. Baking soda is one of several types of leavening agents that allow your cake to rise in the oven, yielding a light, tender crumb. Without baking soda or another leavening agent, your cake will not rise, resulting in a dense, heavy texture. If you forgot or omitted the baking soda in your recipe and already placed the cake in the oven, you will need to start from scratch. If you want to make use of the unrisen cake, you could attempt to use it for cake balls, which involves crumbling the cake, rolling it into balls and coating it in chocolate or another coating. You could also dice your cake into small cubes and use it as a garnish for a mousse or pudding. If you have already made your cake batter but have not yet added your baking soda, it's not too late. 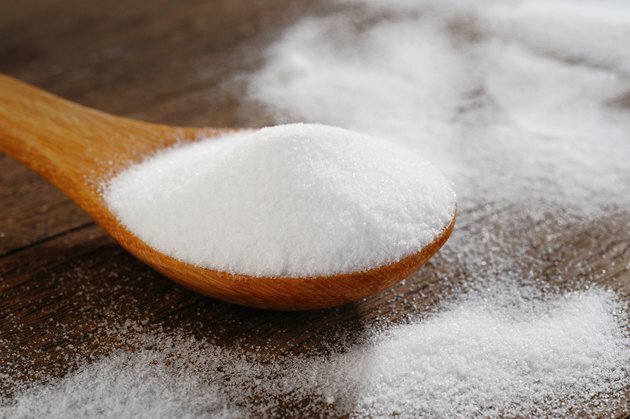 While it's ideal to incorporate your baking soda with the other dry ingredients before combining with the wet ingredients for your cake, you can still add the baking soda at a later stage in a pinch. Stir in the recommended amount of baking soda into the batter. If you have not yet baked your cake and simply wish to find a recipe that does not use baking soda, there are other leavening agent options. Baking soda is a chemical leavening agent made from natural alkaline ingredients. There are two other common types of chemical leavening agents, including baking powder and cream of tartar, which is commonly called for in angel food cake recipes. Find a recipe that uses one of these other chemical leaveners instead. To substitute baking powder for baking soda, use a 4 to 1 ratio. For example, if your recipe calls for 1/4 teaspoon of baking soda, use 1 teaspoon of baking powder. Yeast is a type of biological leavening agent. If you have yeast on hand, you can make a yeasted cake, which will have a drier, more bread-like texture. Unlike chemical leaveners, you will usually need to verify that your yeast is active by first combining it with warm water and allowing it to bloom. After about 10 minutes, your yeast and water mixture will appear foamy and bubbly.